Anton Lawrence is Recreational Aircraft Association of New Zealand (RAANZ) Tech Officer. This article on locking devices originally appeared in RAANZ' magazine Recreational Pilot - Issue #27. While doing research into bolt types I came across several new types of locking systems and found some interesting facts regarding Loctite®. 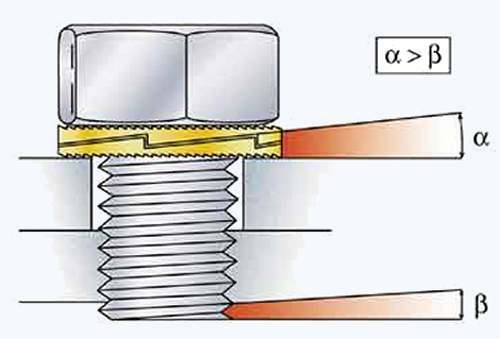 Nut or bolt back off is one reason why bolt preload can be lost, if the bolt is subject to cyclic loads it will break, the type of bolt will only have a bearing on how long it takes to fail. 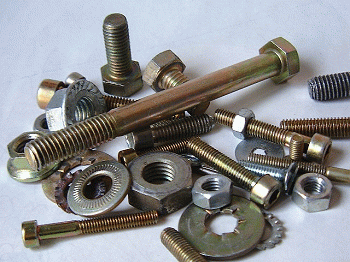 The common types of nut locking devices are spring washer, nylock nut, lock wire, tabs and Loctite®. Under severe vibration all these will fail to some degree. A new type of washer was shown to me by Steelmasters, these are called Nord-Lock® Washers. They have in fact been around for about twenty years but are not well know of. Each washer is in fact two identical washers, one face has many small radial ridges which grip the material being bolted or the underside of the nut or bolt head, the hardness of the washers is more than a 12.9 bolt so no problems there. The other face has small wedges or cams which have an angle slightly greater than the helix angle of the thread of a nut or bolt. When the washers are placed face to face and the nut or bolt tightened, the ridges grip the work, when it comes time to undo, the ridges prevent the washer from turning, the only way out is for the wedged cams to slide up on each other. This sliding causes the bolt to lengthen and so increasing the preload on the bolt, this can not happen without the use of a wrench. The simplicity of use and effectiveness can’t be underestimated. Nord-Lock® also have extensive torque tables and a torque calculation spreadsheet. For more information and a demo video check out www.nord-lock.com. Spiralock® is another method of improving the friction of nut or bolt. It is a different type of female thread form which better distributes the axial force across more threads than a standard thread. 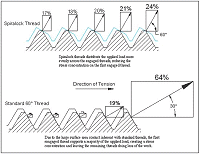 As the forces are spread over a greater number of threads the chance of thread stripping is also reduced. The torque required to tighten a Spiralock® thread is 10% to 15% higher than normal but test should be done if you are considering using these. Spiralock® supply specialized taps to cut the threads and nuts with the specialized thread pre-cut. Loctite® 620 is the thread adhesive specified by Jabiru for the flywheel retaining bolts and several other bolts on their engines. As 620 is not primarily used as a thread lock adhesive I contacted Loctite® directly in order to get more information, the online data sheets do not give friction coefficients. I was told that 620 could be used as a thread locking product; it has the advantage of slower cure about one hour, and higher temperature resistance. I was given some K factors which relate to the friction coefficient of lightly machine oiled steel bolts, in other words Loctite® does not affect the torque of a standard bolt. This would also relate to a friction coefficient of 0.15 and I have used this figure in the torque calculations for the Jabiru bolts. The following is straight from the 620 data sheet. It has also been suggested that 620 would if lightly applied to the mating faces on the Jabiru flywheel, help prevent the fretting. Certainly the extract above would indicate this as a possible application, but I have yet to talk to anyone who has done this or found any other empirical evidence of it having been used in this way, I would be very interested to hear from anyone who has more information on this type of use.